Much of what drives creativity cannot be described, as though it emerges from a mysterious well of opportunity that allows itself to be tapped into. This, to me, is totally magic. Magic is defined as working with energies to bring about change. These energies can be personal, natural, divine, supernatural, or whatever works for you. The magic inherent in select botanicals have been combined with universally recognized symbolism, and the meditative act of embroidery to create these powerful talisman offered in the Mixed Color shop, known as Stitch Wishes. Each talisman is the beginning of a spell for you to cast - from the botanicals chosen, the colors used, and the elements incorporated, each Stitch Wish is created with a specific intention, designed to be added to your personal rituals. While alchemy and symbolism are a major focus of my artistic practice, this is the first tool I’ve been able to offer publicly to help others work with these energies. As my work with these elements expand, so will the magical offerings in the shop. ! Within my community, I’ve seen so many friends connect with the symbolism of my Stitch Wishes, as well as so much curiosity for hand crafts and embroidery in particular. I had numerous requests to create an all inclusive kit for those with an interest in combining craft and magic, and they are now available! With naturally dyed fabrics, lively color palettes, and even a selection of herbs and stones for enhancing your ritual, these kits have everything you need to get started - just add scissors! Read more about the gems and herbs included with each kit here. 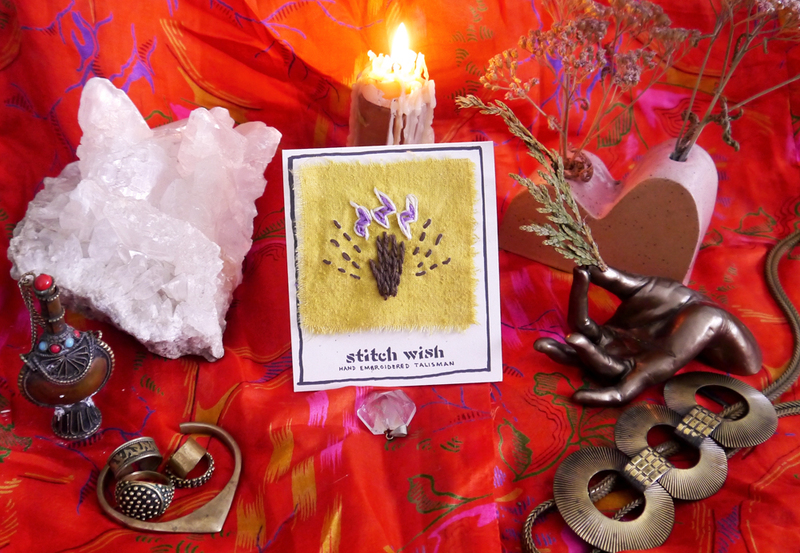 WHAT IS A STITCH WISH? Inspired by mystical dreams of rainbow hued meadows, the dance of sun beams sparkling on the floors of enchanted forests, and magic carpet rides through galaxies near and far, Stitch Wish is an illumination of the symbols dancing throughout time, simultenaeously archaic and futuristic. As above so below, the craft of embroidery sends the thread traveling between worlds through the meditative and visually enhancing stitch work. By stitching this patch to a sacred textile, you're offering a physical representation of the integration of your external and internal worlds. Your light and your shadow. Your conscious and your subconscious. Clothing acts as a barrier between us and the world, able to protect as well as express our physical beings, and can be used to protect or express our energetic bodies as well. 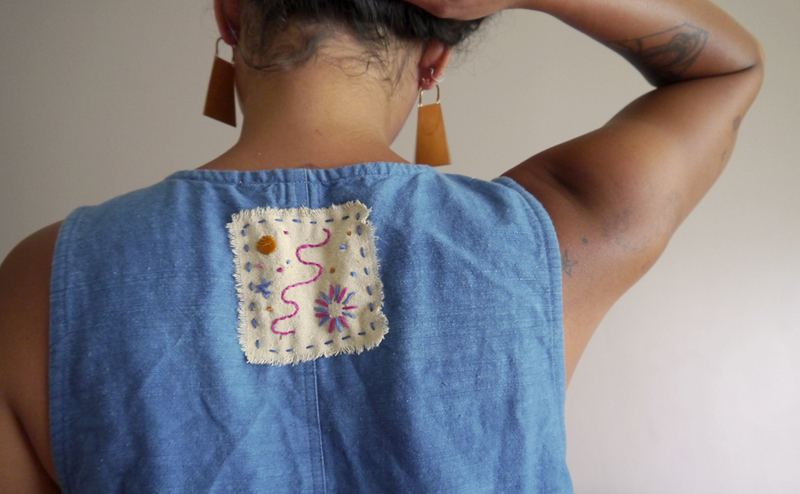 By infusing a garment with a purpose (in this case by embedding a patch of intentional artwork into it) you're able to declare your ambitions out into the world loud and clear. These patches, especially when placed in areas where they can be interacted with frequently, are designed to help trigger the subconscious and open up our minds to the infinite realm of possibilities through the use of symbolism. The act of embroidery embodies the integration of desires - moving from above to below, weaving between worlds. A desire that exists only within the material realm (above) or only within the lower shadow realm (below) is not fully able to be realized - it is the integration from above and below, our conscious and our subconscious, that allows us to find clarity and a path to action. SO ALL I NEED IS A PATCH? This does not omit the need for the deep shadow work of unearthing your underlying patterns and habits, but it can assist with the integration and acceptance of these shadow elements. It is all well and good to have intentions, but more important to do the deep work of liberating yourself from unconscious patterns. Having a frequent reminder of these intentions in the form of wearable art give you an opportunity to check yourself before you wreck yourself. For example, instead of having a "love potion" embroidery, I'm plunging a bit deeper into our subconscious, and planning on offering a tender heart patch (softening and warming one up to the opportunities of love, for those who have developed a protective outer shell) and a rapture patch (to assist in accessing feelings of intimacy and your true sexual essence, for those who find it hard to open up sexually). Stay tuned for these new pieces as the offerings will be frequently updated! I believe that offering up these different options allows for there to be some inquiry into and identification of what the root of the situation is. WHATS THE BEST WAY TO USE THIS MAGIC? Developing a ritual is by far the most effective way to make magic happen. Because I believe everyone is able to access their own personal powers that knows what is best for them, I am hesitant to spell out the steps for making this happen. However, I understand a jumping off point can be helpful, so feel free to use this as framework and add your own elements. Formulate a one to three sentence incantation for this talisman, to be spoken as poetry or sang. Write it down, or commit to memory in some way. Take a few moments to step into a clear and open energetic space, feel free to set up an altar or other physical assertion of intention. Light the appropriate incense for the ritual, waving the stitched fabric in the smoke while repeating this intention. Meditating on the embodiment of these wishes, recognize your earthly and divine connection. Visualize these intentions actualized. See and believe the truth of your infinite possibilities. Stitch the patch onto your garment, repeating the incantation throughout the process. Take a few deep breaths, give thanks, and put out any remaining incense to close out the ritual. Finish up with... "and so it is!" because somewhere in our non-linear quantum field of possibilities, it already is! details on the intention for the wish, a needle and thread to sew on to a sacred garment, sewing instructions and the above suggested ritual outline! Stitch Wish has its own Instagram! 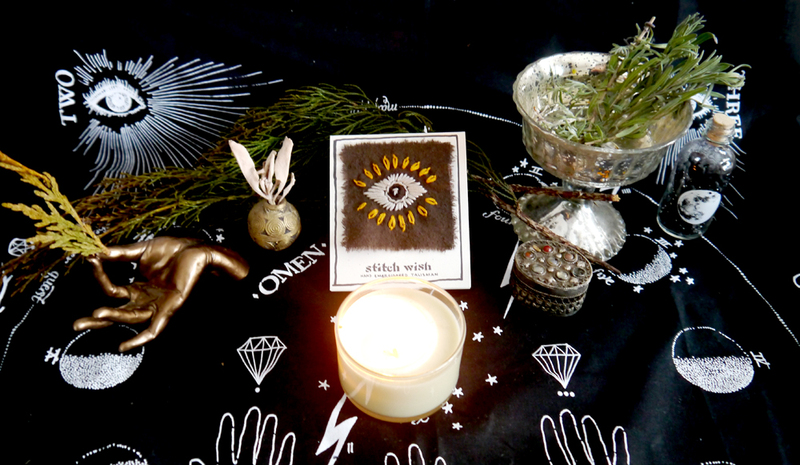 A place where craft and magic meet - sharing mystical studies, symbolism, and metaphysical art through stitches. FOLLOW ALONG THE COSMIC EXPLORATION!